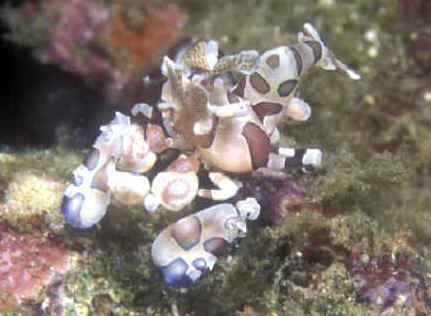 Family Hymenoceridae: Harlequin Shrimp. Four genera. Genus Hymenocera: These shrimp are distinguished by their very stout, broad bodies and large paddle like front legs. Hymenocera elegans Tropical Indo-West Pacific; Red Sea to Australia. Here in N. Sulawesi (Lembeh Strait). Body spots are brown circled in Blue. Occur almost always in pairs. Live in shallow water feeding on echinoderms, principally seastars. Now considered the same species as H. picta. 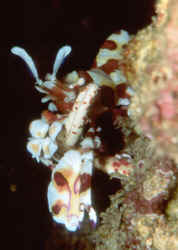 Hymenocera picta Dana 1852, the Eastern Harlequin Shrimp. Anterior first pair of legs look like tweezers, second pair covering them. First antennae flap-like... waved around side to side. Live in pairs only. Noted for their feeding exclusively on echinoderms; starfish and urchins. E. to Central Pacific. To about an inch and a half in length. Aquarium photo. Have red body spots encircled in yellow.